Well, let me clarify. 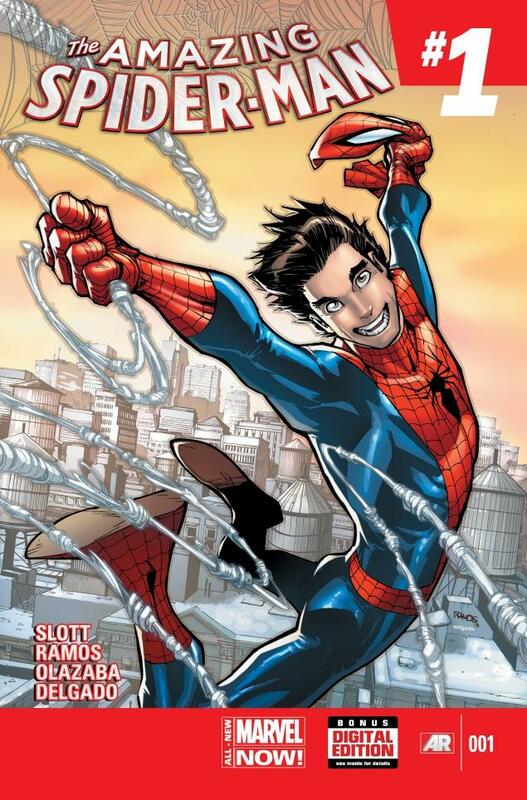 Peter Parker is Spider-Man – again. For the last year, Doctor Octopus has been secretly running (and swinging) around in Peter Parker’s body, while Parker has been desperately trying to reclaim it. It was a bold and controversial move at the time, but after 25 issues of the re-named “Superior” Spider-Man, plus two spin-off titles, and a surprising amount of critical praise and fan acceptance, Peter is back in costume in April’s Amazing Spider-Man #1. Read a great interview with the writer of all this Dan Slott right here. My fave movie magazine, Empire has a quick rundown regarding fantasy casting for The Flash film, starring recently revived Barry Allen. They have some interesting choices from Neil Patrick Harris to Josh Lucas. Check out the other 6 candidates here. Press release below about Wally West in the upcoming Sony MMORPG, DC Universe Online. The games set for release…sometime. Players can create their own characters to team up with DC’s expanding gallery of spandex wearers and live vicariously in the DC Universe. On a related note, Warner Bros. appear to be buying Midway Games, the holders of the Mortal Kombat franchise. I think that’s a good thing. Maybe. 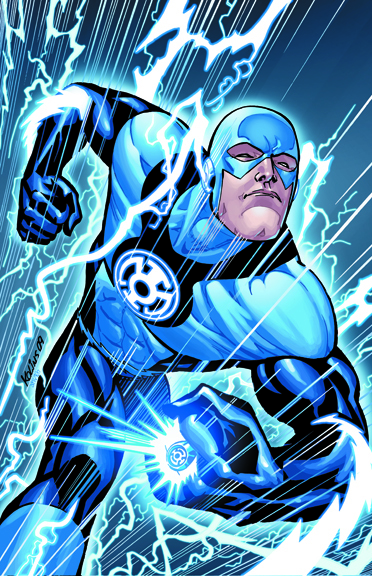 The Fastest Man Alive, Wally West easily runs at light speed vibrates through objects, create explosions through friction – and, when at agonizing top capacity, can manipulate time and bridge dimensions. The Flash is a time-honored member of the Justice League. 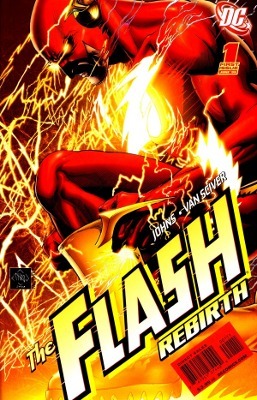 The latest in a long line of Flashes, each with their own unique way of tapping into the primal “Speed Force,” Wally is determined to live up to the noble legacies of speedsters such as Barry Allen, Max Mercury, and Jay Garrick. Flash’s enemies call themselves the Rogues Gallery. 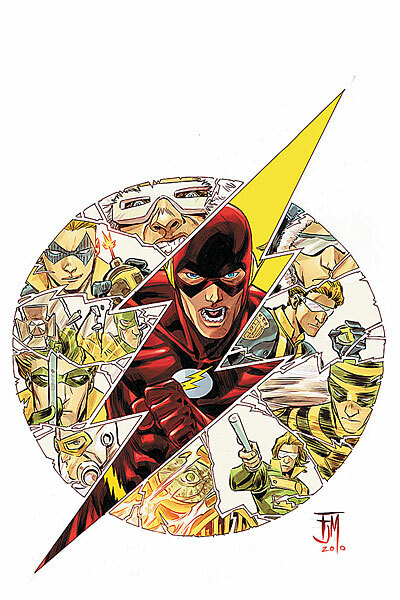 This deadly collection of brutal foes includes Captain Cold, Heatwave, Mirror Master, and the lethal speedster Zoom – villainous threats not just to Keystone City, but the world. Like most readers, I felt disappointed after reading this issue. Sure, superheroes come back from the dead all the time, but Barry Allen, who for a generation of readers wasthe Flash, was dead for a long time. 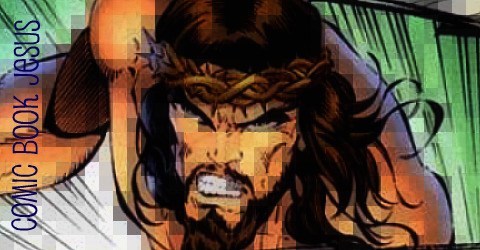 He gave his life to save the world, or worlds, from the Anti-Monitor in 1985’s Crisis on Infinite Earths. 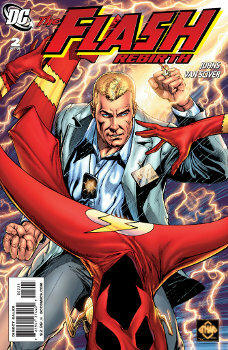 Virtually unseen since then, Barry’s mantle was taken over by his nephew Wally West. In my mind, Wally isthe Flash, and then when Bart Allen showed up as Impulse, and later Kid Flash, that was enough to fulfill my speedster requirements. So why bring Barry back? Good question. And it’s one that goes unanswered here. Writer Geoff Johns and artist Ethan Van Sciver are a great dynamic duo, and they brought Hal Jordan back to the land of the living in Green Lantern: Rebirth 5 years ago. That was a phenomenal, meaningful, action-packed series, and as much as I grew up enjoying Kyle Rayner as GL,it was great to see Hal return. That’s not the feeling I get here. There’s enough of a framework constructed for future issues to build upon, but I can’t really say I’m entirely interested. I’ll keep paying attention though, only because Johns is an expert story builder, and Van Sciver’s art is impressive here, as always, with it’s fluidity and extreme motion. At last year’s Comic-Con I sat in on the panel where Van Sciver explained his enthusiasm for this series and his interpretations of the Speed Force. I look forward to seeing that more than anything else in this series. This is an issue not for newbies, with it’s abundant guest stars (primarily the JSA) and the complicated relationships Barry has with other speedsters (exactly how did Bart get resurrected, and why his anger at Barry’s return?). I can only hope this series will become more focused in the future, and I am somewhat intrigued to see how the DCU adjusts to this latest development. Not much happens here though. 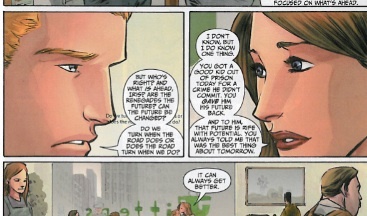 Basically Barry talks with Hal at the Flash Museum, and various other spandex wearers talk about Barry, filling in a few details about him along the way for perplexed readers. I was happy to see the return of Savitar, a villain I haven’t seen in years, and the surprises that the Speed Force holds are intriguing. THough the revelation about Barry’s father-not so much. The ads for this series have claimed that Barry is back and it’s the worst thing that could’ve happened to him. How that plays out will be mildly intriguing, but I guess after the spoils of GL: Rebirth, I was expecting more. This is a slow build rather than a shot out of the gate, but Johns can usually be trusted. I hope he knows what he’s doing.